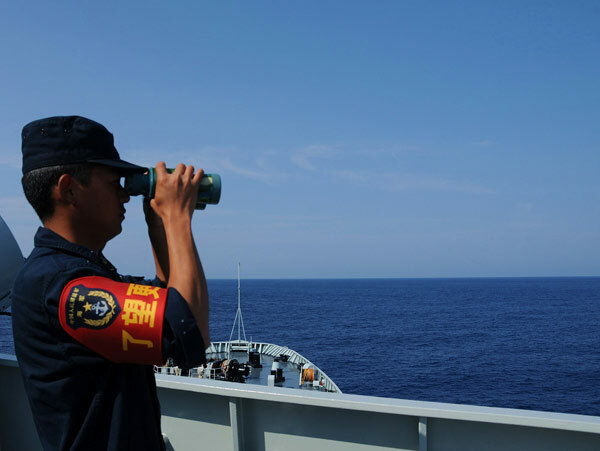 A People’s Liberation Army (PLA) Navy fleet that has conducted patrols and training missions on the South China Sea for the past 11 days is now heading toward the western Pacific Ocean. The four-ship fleet entered the Bashi Channel, an international waterway linking the South China Sea and the Pacific Ocean, around 6 am Friday. It will conduct training on law enforcement, open-ocean interception scenarios and sea area control in the western Pacific. The training is intended to further test the fleet’s capabilities in deep-sea precision striking and integrated air defense battle, as well as evaluate its strategies regarding maritime law enforcement, counter-terrorism work and counter-piracy efforts, according to officers. The fleet consists of the amphibious docking ship Jinggangshan, the missile destroyer Lanzhou, missile frigates Yulin and Hengshui, four ship-borne helicopters and a hovercraft. It left the city of Sanya in south China’s island province of Hainan on March 19 for patrol and open-ocean training missions.